Indiana Jones and the Temple of Doom (Spielberg, 1984) has established itself as a classic action adventure film. This film, true to the series, plays on the elements of asserting white male masculinity as a symbol of modernity and superiority of the West. Through these ideas, the film operates by displaying action sequences, usually violent, to further elements described above through the main character, Indiana Jones. This film combines the action-adventure genre with western ideology through the representation of white superiority and modernity. Ultimately, it reinforces dominant ideologies and conventions of classical Hollywood surrounding gender, class, and nationalism. In Temple of Doom, the audience is immediately introduced to the character Short Round (or Shorty), an eleven-year-old Chinese boy that serves as Indy’s side-kick. It is noteworthy to point out that very few main characters are not white; however, when a Chinese character is cast, he is cast as a young boy (an attempt at emasculation) who serves mainly as comic relief for the plot and story. It is also assumed in the film that Indy has come to know Shorty after rescuing him from a crime boss in Shanghai, China. This allows Indy, symbolizing the west, to fulfill the role of rescuer and a symbol of liberation that continues throughout the film. 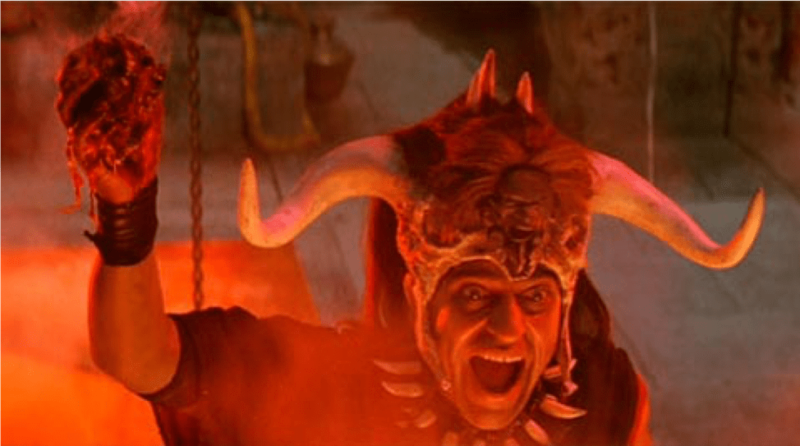 Temple of Doom also establishes a problematic relationship and portrayal of “The Native.” When Indy travels to India, the portrayal of the native character is that of a savage. A well-remembered scene in the film is when Indy and crew are introduced to the village chief and are served monkey brains for dinner. In this scene, the disgust from the western visitors is clear and no attempt to acknowledge alternative cultures is made or posited. There is also an exploitation of Indian culture that serves the film as a “new world” or a feeling of voyeurism for the Western viewer. This film also inaccurately represents Indian culture, cuisine, and lifestyle in almost every way. Additionally, throughout the film, the Indian identity and people are portrayed as underdeveloped and in need of Indy’s “Western guidance.” This is also used to further the action-adventure plot, as the natives need Indy to rescue them. Specifically, he needs to rescue their children from a cult group who has enslaved them to mine sacred crystals and mythical stones. The use of violence is also a common trait of the action-adventure genre and it is certainty abundant in Temple of Doom. This film often uses explosions, blood, guts, and gunfire to ramp-up the action. This film in particular used this to such an effect that Temple of Doom has been credited for the implementation of the PG-13 rating system. Scenes that glorified the use of ultra-violence include many of the human sacrifice scenes that involve ripping out a human heart while it is still beating. This type of violence is often depicted in the hard-bodied action film genre, but often crosses over into action adventure which is depicted here as well. As pointed out by Drew Ayers, the hard-body genre often shows the action hero undergoing torture or trauma. This is a key cross-over element portrayed in the film, when Indy is captured and about to be taken as a human sacrifice. Classical Hollywood gender roles (in the 80s) are reinforced in this film, particularly concerning the role of Willie, Wilhelmina Scott, Indy’s love interest. In this film, Willie is little more than a damsel in distress who is in constant need of rescue. Willie is given very little agency as a character and exists only to serve as Indy’s prop. This is demonstrated in the film by Willie’s character constantly complaining, screaming, or being overly frightened. There are also many moments in the film where Willie is portrayed as being delicate. For example, after an action sequence where the characters nearly die, Willie is dismayed because she broke a nail. By deconstructing classical Hollywood archetypes and by examining master concepts of identity, scholars and society can continue the work of finding ways to best express the human experience and learn to champion people of all races, genders, and ethnicities by providing a platform to tell their stories through their own experiences.